season-opening game against Northwestern-Roseville on Sept. 8 at 7 p.m. at Edor Nelson Field. 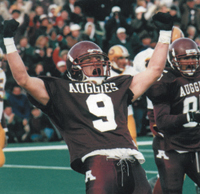 The Auggies went 10-2 in 1997, reaching the second round of the NCAA Division III national playoffs. It marked just the second conference championship in football for the Auggies; the first was in 1928.
retire the No. 30 jersey of former wide receiver Scott Hvistendahl.